The barometer, thermometer, and anemometer are important meteorology instruments. 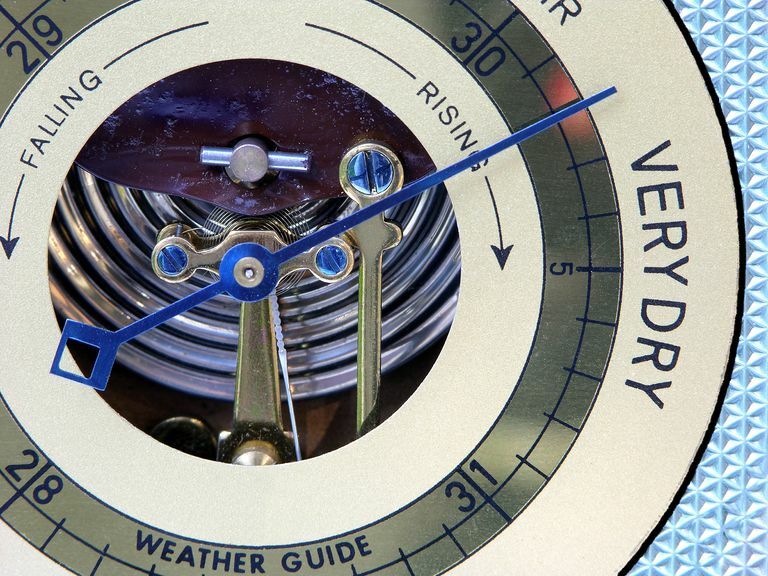 Learn about the invention of the barometer, how it works, and how it's used to forecast weather. A barometer is a device that measures atmospheric pressure. The word "barometer" comes from the Greek words for "weight" and "measure." Changes in atmospheric pressure recorded by barometers are most often used in meteorology for forecasting weather. Usually you'll see Evangelista Torricelli credited with inventing the barometer in 1643, French scientist René Descartes described an experiment to measure atmospheric pressure in 1631 and Italian scientist Gasparo Berti constructed a water barometer between 1640 and 1643. Berti's barometer consisted of a long tube filled with water and plugged at both ends. He placed the tube upright in a container of water and removed the bottom plug. Water flowed from the tube into the basin, but the tube did not completely empty. While there may be disagreement over who invented the first water barometer, Torricelli is certainly the inventor of the first mercury barometer. water-based barometers - most often consists of a sealed glass ball that is half-filled with water. The body of the ball connects below the water level to a narrow spout, which rises above the water level and is open to the air. The water level of the spout rises when atmospheric pressure is lower than it was when the glass ball was sealed and drops when air pressure exceeds the pressure when the ball was sealed. While not particularly precise, this is a simple type of barometer easily constructed at home or in a lab. mercury barometers - uses a glass tube that is closed at one end, standing in a mercury-filled reservoir that is open to air. A mercury barometer works on the same principle as the water barometer, but is much easier to read and more sensitive than a water barometer. Barometric pressure is a measure of the weight of the atmosphere pressing down on the Earth's surface. High atmospheric pressure means there is a downward force, pressure air down. As air moves down, it warms up, inhibiting the formation of clouds and storms. High pressure typically signifies fair weather, particularly if the barometer registers a lasting high pressure reading. When barometric pressure drops, this means air can rise. As it rises, it cools and is less able to hold moisture. Cloud formation and precipitation becomes favorable. Thus, when a barometer registers a drop in pressure, clear weather may be giving way to clouds. While a single barometric pressure reading won't tell you too much, you can use a barometer to forecast changes in the weather by tracking readings throughout the day and over the course of several days. If the pressure holds steady, weather changes are unlikely. Dramatic changes in pressure are associated with changes in the atmosphere. If pressure suddenly drops, expect storms or precipitation. If pressure rises and stabilizes, you're more likely to see fair weather. Keep a record of barometric pressure and also wind speed and direction to make the most accurate forecasts. In the modern era, few people own storm glasses or large barometers. However, most smart phones are able to record barometric pressure. A variety of free apps are available, if one doesn't come with the device. You can use the app to relate atmospheric pressure to weather or you can track the changes in pressure yourself to practice home forecasting. Strangeways, Ian. Measuring the Natural Environment. Cambridge University Press, 2000, p. 92. The Invention of the Barometer, Weather Doctor's Weather People and History, retrieved October 6, 2015.